I'm a huge yogurt lover. Recently I have started to really enjoy Greek yogurt too! However, I have my favorite brands that I tend to be more loyal to when it comes to buying Greek yogurt at the store. My new favorite brand? That would be Wallaby Organic Greek yogurt! I recently had the opportunity to try several of Wallaby's Nonfat Organic Greek yogurt cups. So Cohen and I headed to Whole Foods and we were greeted by quite a good selection of flavors. I almost didn't know which ones to choose because all of the flavors looked so yummy! Finally I made my selections and we were on our way to taste testing! The real test came when I brought the Greek cups home. Some Greek yogurt has a different texture that honestly makes me gag and I refuse to buy it again. Wallaby Nonfat Organic Greek Yogurt definitely does not have this problem! The yogurt is creamy and super smooth. Then you have a little side cup attached to the main yogurt cup that is filled with the fruit add-ins. The fruit was sweet and the perfect amount to mix into my cup. My friend at lunch even commented on how it reminded her of the fruit you'd find on a cheesecake. But what I loved even more about Wallaby is how their yogurt is made. The organic milk that is used in their yogurt is from local farms. By using what was learned about yogurt in Australia, Wallaby then uses a gentle cooking method to cook the yogurt in small batches that guarantees the soft and creamy texture of their yogurt. Their products are clean and free of any artificial additives, which makes the yogurt even tastier! Wallaby Organic Greek Yogurt Cups are low in calories, smooth to the taste and contains premium organic ingredients. These tasty yogurt cups make the perfect snack or even a great addition to your meals. 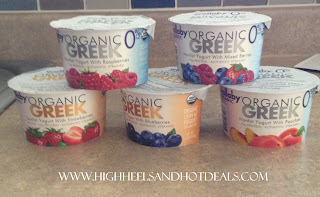 Wallaby Organic Greek Yogurt cups promise quality taste that your family will love! --To purchase your Wallaby Greek Yogurt Cups, visit your local Whole Foods store. You can also visit their website for more information. --Three (3) lucky winners will win a prize pack of five (5) coupons good for 5.5-6oz products. This giveaway is run via Rafflecopter. The more entries completed, the better your chances of winning! Open to US residents only. This product review was made possible by Wallaby Yogurt. I was not compensated for this review other than a product sample. All opinions are 100% mine. I love black cherry yogurt.